Only 450 examples are being produced – and they will only be available in Japan. Subaru will be giving us a glimpse of the new next-gen WRX in the form of the VIZIV Performance Concept at next month's Tokyo Motor Show – but that won’t be the only Scooby sports car that will debut at the show. Joining it will be souped-up versions of the current-gen BRZ and WRX STI. The BRZ STI Sport will feature a more rigid body and re-tuned suspension, while the spiced up WRX is a successor to the S207 Special Edition launched a few years ago. Called the S208 Special Edition, it’s faster and more powerful than the US-spec WRX STI. And like last year’s S207 Special Edition, it will only be available in Japan, sadly. 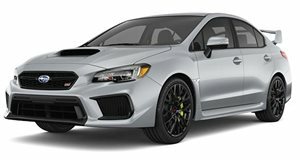 Limited to 450 units, the Japan-only Subaru WRX STI S208 features the same modifications as the previous special edition model such as a carbon roof that reduces weight and lowers the center of gravity. However, Subaru is promising a significant performance boost over the S207. The Japanese automaker hasn’t provided any specific details, but modifications made to the 2.0-liter turbo boxer have made it more powerful than the current US-spec 2.5-liter WRX STI Type RA. Subaru says the S208 has “improved engine output and acceleration performance” over the S207. That means we can expect the output to exceed 323 horsepower and 318 lb-ft of torque. Upgraded suspension rounds off the mechanical upgrades. Distinguishing the S208 from the regular WRX STI is a unique body kit with a splitter attached to the front bumper and a huge rear wing. Inside, the cabin is adorned with leather bucket seats with a stylish two-tone design and red accents on the dashboard matching the grille and rear bumper. As if it wasn’t already limited enough with only 450 examples planned for production, the S208 isn’t being offered on a traditional first come, first serve basis. Subaru isn't hand picking eligible customers, either. Instead, interested buyers will need to sign up to a lottery to be given a chance of owning the Japan-only performance sedan. Expect to find out the specifications of this souped-up Subaru WRX STI at the Tokyo Motor Show which starts October 25.